The Rosary (from Latin rosarium, meaning "rose garden" or "garland of roses") is a popular traditional Roman Catholic devotional practice, which denotes both a set of prayer beads and the devotional prayer itself. The prayers consist of repeated sequences of the Lord's Prayer followed by ten recitations of the Hail Mary and a single recitation of "Glory Be to the Father"; each of these sequences is known as a decade. The recitation of each decade is accompanied by meditation on one of the Mysteries of the Rosary, which are events in the lives of Jesus Christ and his mother, the Blessed Virgin Mary. The traditional 15 Mysteries of the Rosary were finalized by the sixteenth century. The mysteries were grouped into three sets: the joyful mysteries, the glorious mysteries, and the sorrowful mysteries. In 2002, Pope John Paul II announced five new optional mysteries, the luminous mysteries, bringing the total number of mysteries to 20. Emphasis on the rosary is part of the Roman Catholic focus on Mariology, as exemplified by Pope John Paul II's Apostolic Letter Rosarium Virginis Mariae which builds on the "total Marian devotion" pioneered by Saint Louis de Montfort. On the Roman Catholic liturgical calendar the Feast of Our Lady of the Rosary is celebrated on October 7. The rosary is sometimes used by other Christians, especially in the Anglican Communion and the Old Catholic Church, and also by some Lutherans. Evangelical Protestants, however, such as Baptists and Presbyterians do not use it and actively discourage their members from using this method of prayer. Many similar prayer practices exist in popular Roman Catholicism, each with its own set of prescribed prayers and its own form of prayer beads, such as the prayer rope in Eastern Orthodox Christianity. These other devotions and their associated beads are usually referred to as "chaplets." There are differing views on the history of the rosary. According to Roman Catholic tradition, the rosary was given to Saint Dominic in an apparition by the Blessed Virgin Mary in the year 1214 in the church of Prouille. This Marian apparition received the title of Our Lady of the Rosary. However, most scholarly research suggests a more gradual and organic development of the rosary. Prayers with beads like the rosary may have begun as a practice by the laity to imitate the monastic Liturgy of the Hours, during the course of which the monks prayed the 150 Psalms daily. As many of the laity and even lay monastics could not read, they substituted 150 repetitions of the Our Father (Pater noster in Latin) for the Psalms, sometimes using a cord with knots on it to keep an accurate count. During the middle ages, evidence suggests that both the Our Father and the Hail Mary were recited with prayer beads. In the seventh century, Saint Eligius wrote of using a counting device to keep track of the 150 Hail Marys of the Psalter of Mary. In thirteenth century Paris, four trade guilds existed of prayer bead makers, who were referred to as paternosterers, and the beads were referred to as paternosters, suggesting a continued link between the Our Father (Pater noster in Latin) and the prayer beads. In the twelfth century, the rule of the English anchorites, the Ancrene Wisse, specified how groups of fifty Hail Marys were to be broken into five decades of ten Hail Marys each. Gradually, the Hail Mary came to replace the Our Father as the prayer most associated with beads. Eventually, each decade came to be preceded by an Our Father, which further mirrored the structure of the monastic Liturgy of the Hours. The practice of meditation during the recitation of the Hail Marys can be attributed to Dominic of Prussia (1382-1461), a Carthusian monk. Regardless of the origin of the rosary, it was greatly promoted by the preaching of the Dominican priest Alan de Rupe, who helped to spread the devotion in France, Flanders, and the Netherlands between 1460 and his death in 1475. From the sixteenth to the early twentieth century, the structure of the rosary remained essentially unchanged. There were 15 mysteries, one for each of the 15 decades. In the twentieth century the addition of the "Fatima Prayer" to the end of each decade became popular. There were no other changes until 2002 when John Paul II instituted five optional new Luminous Mysteries. Seventh century, Saint Eligius (c. 588-660) wrote of making a chair adorned with 150 gold and silver nails to aid in the recitation of the Psalter of Blessed Mary, which substituted one Hail Mary for each of the Psalms. In the early eighth century, Venerable Bede (d. 733) attests that churches and public places in France and England had prayer beads available for the faithful to use. A rule for anchorites in mid-twelfth century England gives directions on how 50 Hail Marys are to be said divided into sets of ten, with prostrations and other marks of reverence. Twelfth century Mary-legends (Marien-legenden) where it is recorded that a certain Eulalia was told to pray five decades slowly and devoutly instead of 15 decades in a hurry. It is recorded by a contemporary biographer that Saint Aibert, who died in 1140, recited 150 Hail Marys daily, 100 with genuflexions and 50 with prostrations. It is recorded of St. Louis of France, who lived in the thirteenth century, that "without counting his other prayers the holy King knelt down every evening fifty times and each time he stood upright then knelt again and repeated slowly an Ave Maria." 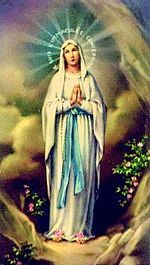 1917 Our Lady of Fatima is said to ask that the Fatima Prayer be added to the Rosary. Her visionaries state that she also asks for the Rosary to be said to stop the war, and as part of the Immaculate Heart's reparation. 1974 Pope Paul VI issues the Apostolic Letter Marialis Cultus which devotes 14 sections to the use of the rosary within the Roman Catholic Church. 2002 Pope John Paul II introduces the Luminous Mysteries as an option for Roman Catholics in an Apostolic Letter on the Rosary, Rosarium Virginis Mariae. A rosary provides a physical method of keeping track of the number of Hail Marys said. The fingers are moved along the beads as the prayers are recited. By not having to keep track of the count mentally, the mind is more able to meditate on the mysteries. A five decade rosary contains five groups of ten beads (a decade), with additional large beads before each decade. The Hail Mary is said on the ten beads within a decade, while the Our Father is said on the large bead before each decade. A new mystery is meditated upon at each of the large beads. Some rosaries, particularly those used by religious orders, contain 15 decades, corresponding to the traditional 15 mysteries of the rosary. Both five and fifteen decade rosaries are attached to a shorter strand, which starts with a crucifix followed by one large, three small, and one large beads before connecting to the rest of the rosary. The recitation of the rosary is started on the short strand, reciting the Apostle's Creed at the crucifix, an Our Father at the first large bead, three Hail Marys on the next three beads, then a Glory be to the Father on the next large bead. The recitation of the decades then follows. Although counting the prayers on a string of beads is customary, the prayers of the rosary do not actually require a set of beads, but can be said using any type of counting device, by counting on one's fingers, or by counting by oneself without any device at all. The beads can be made from wood, bone, glass, crushed flowers, semi-precious stones such as agate, jet, amber, or jasper, or precious materials including coral, crystal, silver, and gold. Rosaries are sometimes made from the seeds of the "rosary pea" or "bead tree." Today, the vast majority of rosary beads are made of glass, plastic, or wood. Early rosaries were strung on strong thread, often silk, but modern ones are more often made as a series of chain-linked beads. Our Lady's Rosary Makers produce some seven million rosaries annually that are distributed to those in economic and spiritual need. It is especially common for beads to be made of material with some special significance, such as jet from the shrine of Saint James at Santiago de Compostela, or olive seeds from the Garden of Gethsemane. Beads are sometimes made to enclose sacred relics, or drops of holy water. A set of blessed Rosary Beads is a sacramental. In addition to a string of beads the rosary comes in other forms for ease of use. A ring rosary is a finger ring with eleven knobs on it, ten round ones and one crucifix. A rosary bracelet is one with ten beads and often a cross or medal as well. The most modern form is the rosary card. A rosary card is either one with a "handle" that moves like a slide rule to count the decade, or it has a whole rosary with bumps similar to Braille. Rosary beads are at times used to say Roman Catholic rosary based prayers which do not involve the Hail Mary and the mysteries of the rosary. Examples include the Chaplet of Divine Mercy introduced by Saint Faustina Kowalska and the Rosary of the Holy Wounds introduced by the Venerable Sister Mary Martha Chambon. These prayers often use rosary beads, but their words and format do not correspond to the usual mysteries. Both Saint Faustina Kowalska and the Venerable Sister Mary Martha Chambon attributed these prayers to Jesus as part of their Visions of Jesus and Mary|visions of Jesus Christ. 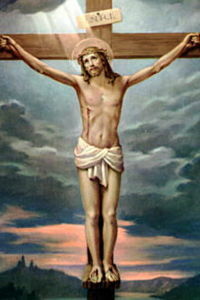 The Crucifixion of Jesus - the fifth of the Sorrowful Mysteries. The recitation of the Rosary is traditionally dedicated to one of three sets of "Mysteries" to be said in sequence, one per a day: the Joyful (sometimes Joyous) Mysteries; the Sorrowful Mysteries; and the Glorious Mysteries. Each of these three sets of Mysteries has within it five different themes to be meditated on, one for each decade of ten Hail Marys. Pope John Paul II, in his apostolic letter Rosarium Virginis Mariae (October 2002), recommended an additional set called the Luminous Mysteries (or the "Mysteries of Light").Catholic faithful who prefer the original fifteen mysteries point to the belief that the Rosary is Mary's Psalter, containing 150 Hail Marys in its body for the 150 Psalms. The Luminous Mysteries make the total 200, but incorporate Christ's ministry. A "Hail Holy Queen" and a sign of the cross. Many people add a recitation of the Fatima Decade Prayer at the end of each Decade. In the practice of the Brothers of the Christian Schools, they have an additional decade for the intentions of the students or the Blessed Virgin Mary. A pious German custom is to insert a phrase in the middle of each Hail Mary (after "… blessed is the fruit of thy womb, Jesus … "), which refers to the specific mystery being meditated upon. This custom was incorporated into Saint Louis de Montfort's second method out of his five Methods of Praying the Rosary. Glory to the Father, and to the Son, and to the Holy Spirit, as it was in the beginning, is now, and ever shall be, world without end. Amen. The custom of the family recitation of the Holy Rosary is a most efficacious means. What a sweet sight - most pleasing to God - when, at eventide, the Christian home resounds with the frequent repetition of praises in honor of the High Queen of Heaven! Then the Rosary, recited in the family, assembled before the image of the Virgin, in an admirable union of hearts, the parents and their children, who come back from their daily work. It unites them piously with those absent and those dead. It links all more tightly in a sweet bond of love, with the most Holy Virgin, who, like a loving mother, in the circle of her children, will be there bestowing upon them an abundance of the gifts of concord and family peace. In Monastic Houses, monks were expected to pray the Divine Office daily in Latin, the liturgical language of the Roman Catholic Church. In some Houses, lay brothers who did not understand Latin or who were illiterate were required to say the Lord's Prayer a certain number of times per day while meditating on the Mysteries of the Incarnation of Christ. Since there were 150 Psalms, this could number up to 150 times per day. To count these repetitions, they used beads strung upon a cord and this set of prayer beads became commonly known as a Pater noster, which is the Latin for "Our Father." Lay people adopted this practice as a form of popular worship. The Paternoster could be of various lengths, but was often made up of five “decades” of ten beads, which when performed three times made up 150 prayers. Other Paternosters, most notably those used by lay persons, may have had only had 10 beads, and may have also been highly ornamented. As the Rosary (ring of flowers) incorporating the Hail Mary prayer became more common, it was often still referred to as a Paternoster. In 1233, seven of the members of a Florentine Confraternity devoted to the Holy Mother of God were gathered in prayer under the presidency of Alessio Falconieri. According to tradition, Mary appeared and exhorted them to devote themselves to her service, in retirement from the world. They retired to the deserted slopes of Monte Senario near Florence, where they experienced another vision of Mary. There they formed a new Order called the Servants of Mary, or Servites, in recognition of their special manner of venerating Our Lady of Sorrows. The seven-"week" Servite Rosary is variously called the Servite Chaplet; Rosary of the Seven Dolors of the Blessed Virgin Mary; and the Seven Swords Rosary. A set of introductory prayers for the Servite Rosary was written by Saint Alphonsus Liguori in his book The Glories of Mary. The Irish (specifically the Gaelic-speaking) and their descendants have a tradition of saying 13 Aves rather than ten, in honor of Saint Anthony of Padua, whose feast day is June 13. Also called the St. Anthony Chaplet, its prayers are accompanied by a poem called the Miraculous Responsory or si quideris, written by Saint Bonaventure. In 1263, Saint Bonaventure encouraged liturgical devotion honoring the mystery of The Visitation. The Franciscan Crown, officially established in 1422, consists of seven decades of Hail Marys, each preceded by an Our Father and followed by a Glory Be, and completed by two more Hail Marys after the 7th decade to complete the number 72 which is thought to be the age of Mary at the time of her Assumption. The Crown recalls the seven joys of Mary and how she responded to the grace of God in her life. Franciscans are credited with adding the final words to the Hail Mary: Jesus. Holy Mary, Mother of God, pray for us sinners (from the writings of St. Bernardino of Siena) now and at the hour of our death (from the writings of the Servite Fathers and the Roman Breviary). The rosary as prayed by the Birgittine order comprises 7 Our Fathers (to honor the joys and sorrows of the Blessed Virgin), and 63 Hail Marys, one for each (presumed) year of her life before the Assumption. The layout of the beads is a loop containing six decades, together with a short string of beads leading to the crucifix. An example of the Birgittine rosary may be seen depicted on the Statue of the Crowned Virgin in the Sanctuary of Our Lady of Lourdes. These rosaries, especially the smaller ring-type, have since become known as soldiers' rosaries, because they were often taken into battle by soldiers, most notably during World War I. These single-decade Rosary variations can be worn as a ring or carried easily and are still popular. A rosary ring is a ring worn around the finger with 10 indentations and a cross on the surface, representing one decade of a rosary. This is often worn as jewelry, and used through the day. Some ring Rosaries use a small bearing on the inside of the ring to permit easy turning. A finger Rosary is similar to a ring, but is a bit larger. Rosaries like these are used by either rotating or just holding them between a finger and thumb while praying. A hand Rosary is a decade in a complete loop, with one bead separated from ten other beads, this is meant to be carried while walking or running, so as not to entangle the larger type. Credit card-sized Rosaries have also appeared, especially among members of militaries, where holes or bumps represent the prayers and the persons praying move their fingers along the bumps to count prayers. While use of the Roman Catholic rosary has gradually been adopted by many Eastern Catholics, many Eastern Catholic churches have undertaken a campaign of liturgical de-Latinization, removing imported devotions and practices (such as the rosary) that have obscured and replaced traditional and authentic devotions and practices of the Eastern Catholic Churches. Subsequently, the most common prayer used in the Eastern Christian Churches (Eastern Orthodox and Eastern Catholic) is the Jesus Prayer, which makes use of the more ancient prayer rope (chotki), a knotted rope (rather than beads) joined together with a knotted cross. The prayer rope is not as fixed in form as the Western rosary (it may have 10, 33, 50, 100, or 500 knots on it), and it normally makes use of beads only as dividers between sections. The Eastern prayer rope is often divided into decades, but it may also be divided into sections of 25 or some other number, or not divided at all. Among High Church Anglicans, Anglican prayer beads are sometimes used. This set is also known as the "Anglican Rosary" or as "Christian prayer beads," the latter term arising from the popularity this set has gained among Christians of various other traditions. Anglican bead sets contain 28 beads in groups of seven called "weeks," with an additional large bead before each. In total, there are 33 beads representing the years of Jesus' life on Earth. A number of Anglicans use the Jesus Prayer, just like the Eastern Christians, but there are no Church-appointed prayers or meditations in the Anglican practice. Some Anglo-Catholics use the traditional Roman Catholic rosary. A recent creation known as the Ecumenical Miracle Rosary uses the same beads as the Roman Catholic rosary but with different prayers and with mysteries which focus on Christ's miracles. Wearing of a Rosary that one actually uses to pray is neither uncommon nor sacrilegious in various Roman Catholic-adherent cultures and was a common practice in the Medieval and Renaissance periods, particularly among religious (monks, nuns, and friars). Rosaries are also worn hanging from or looped over a belt, particularly with some religious habits, pinned to and hanging from a shoulder or neckline, or wrapped around a wrist or arm as a bracelet. Some Christians feel that it is sacrilegious for a non-believer to wear a rosary around the neck. This is especially true in Roman Catholic cultures that have histories of persecution, particularly among the Irish and English Catholics. Because Irish Catholic tradition is often seen as normative in the United States and Canada, this has been the source of some conflict in the past. The Roman Catholic Church states: "Sacred objects, set aside for divine worship by dedication or blessing, are to be treated with reverence. They are not to be made over to secular or inappropriate use, even though they may belong to private persons". Thus it is acceptable to wear a rosary if one is doing so to show veneration, however it is not acceptable if one is wearing the rosary irreverently, such as wearing it as a piece of jewelry. Many saints have worn their Rosary around the neck, and in the Secret of the Rosary, it is mentioned that a person put his rosary round his neck to keep devils away from him. Rosaries or rosary-like necklaces are often worn for non-religious purposes as a fashion or jewelry item, and are sold in different variations in popular jewelry and clothing stores. Such ornamental use, especially the wearing of a rosary around the neck, was heavily popularized by singer Madonna in the early 1980s and has experienced a come-back in recent years. Wearing a rosary around the neck can be considered disrespectful if the person wearing it does not affiliate with the Christian religion. Ornate or medieval-style rosary sets are occasionally featured in "goth" fashion. As early as the fifteenth century, legend alleged that through Saint Dominic and Blessed Alan de Rupe the Blessed Virgin Mary made 15 specific promises to Christians who pray using the rosary. The 15 rosary promises range from protection from misfortune to meriting a high degree of glory in heaven. In support of this statement Patrick Cardinal Hayes of New York provided his imprimatur to this effect. In the eighteenth century, the French priest Louis de Montfort elaborated on the importance of the rosary and its power in his widely read book the Secret of the Rosary. He emphasized the power of the rosary and provided specific instructions on how it should be prayed, e.g. with attention, devotion and modesty (reverence), with reflective pauses  between the beads and smaller pauses between phrases of the prayers. ↑ "Rosary." Online Etymology Dictionary. Douglas Harper Retrieved June 25, 2008. ↑ "Rosary." Hensleigh Wedgewood. A Dictionary of English Etymology. 2nd ed. (London: Trubner & Co., 1872), 544. Retrieved June 25, 2008. ↑ Pope John Paul II's Apostolic Letter Rosarium Virginis Mariae Retrieved June 25, 2008. ↑ 5.0 5.1 5.2 5.3 5.4 5.5 5.6 5.7 5.8 5.9  New Advent. CATHOLIC ENCYCLOPEDIA: The Rosary. Retrieved June 25, 2008. ↑ Bernard O'Reilly. True Men as We Need Them: A Book of Instruction for Men in the World. (New York: P.J. Kennedy and Sons. 1878), 217 Retrieved June 25, 2008. ↑ McNicholas, J.T. "Alanus de Rupe." The Catholic Encyclopedia. (New York: Robert Appleton Company, 1907) Retrieved June 25, 2008. ↑  O'Reilly (1878), 217. Retrieved June 25, 2008. ↑ CATHOLIC ENCYCLOPEDIA: Rosary Retrieved June 25, 2008. ↑ CATHOLIC ENCYCLOPEDIA: Hail Mary Retrieved June 25, 2008. ↑ New Advent CATHOLIC ENCYCLOPEDIA: Hail Mary Retrieved June 25, 2008. ↑ Mysteries of the life Retrieved June 25, 2008. ↑ Pope Paul VI's Apostolic Letter Marialis Cultus. Retrieved June 25, 2008. ↑ "Our Lady's Rosary Makers". Retrieved June 25, 2008. ↑ St. Louis-Marie de Montfort explains this correlation Retrieved June 25, 2008. ↑ St. Louis-Marie de Montfort, Methods for saying the rosary, first and third method Retrieved June 25, 2008. ↑ Rosary Prayers in German Retrieved June 25, 2008. ↑ Rosary Prayers in Several Languages. Retrieved June 25, 2008. ↑ Methods for Saying the Rosary. Retrieved June 25, 2008. ↑ Alphonsus Liguori. The Glories of Mary. (trans. from Italian) (London: Redemptorist Fathers, St. Mary's. 1852), 611-614. Retrieved June 25, 2008. ↑ . New Advent CATHOLIC ENCYCLOPEDIA: Use of Beads at Prayers. Retrieved June 25, 2008. ↑ Quick Questions (This Rock: October 2004) Retrieved June 25, 2008. ↑ Dominican Fathers on the Rosary.rosary-center.org. Retrieved June 25, 2008. ↑ Rosary promises catholic.org. Retrieved June 25, 2008. ↑ Saint Louis de Montfort.themonfortacademy.org. Retrieved June 25, 2008. Liguori, Alfonsus. The Glories of Mary. (trans. from Italian) London: Redemptorist Fathers, St. Mary's, 1852., 611-614. O'Reilly, Bernard. True Men as We Need Them: A Book of Instruction for Men in the World. New York: P.J. Kennedy and Sons, 1878. This page was last modified on 19 July 2015, at 19:19.